Remember when your day used to involve running across campus from classes to office hours to club meetings? Now that you’re at a desk between 9 a.m. and 5 p.m., the sudden lack of exercise may be driving you crazy. Don’t get us wrong, office life has its perks, but sitting in a chair for 40+ hours a week can make you feel pretty sluggish. So how do you avoid this real-world slump? 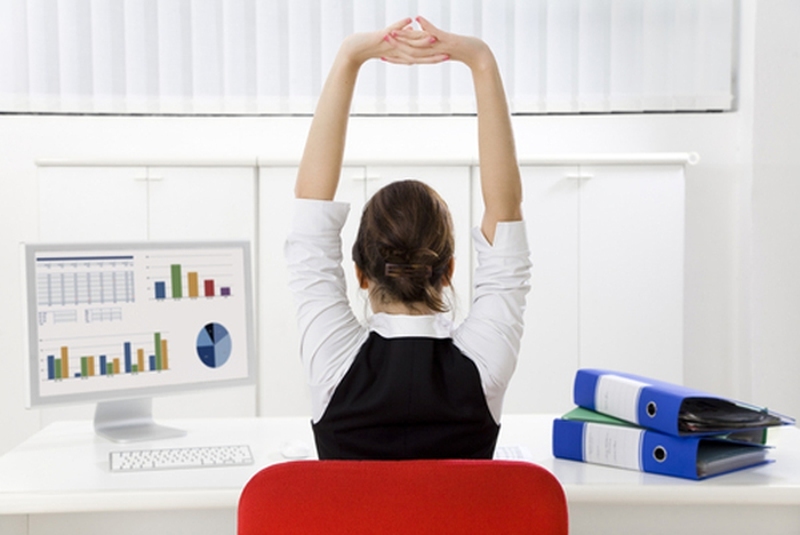 We’ve compiled a great list of ways to stay healthy on the job! This is the number one tip Susan Holmberg, a specialist for behavior change for weight management, has for women who want to work exercise into their day: Hook your “workout” onto something you're going to do anyways! It’s pretty obvious, but working some exercise into your day in the way that you get yourself to the office is an easy (and free!) way to make sure you’re staying healthy. If your office is way too far to walk to, consider getting off the bus or train a stop or two early so you walk a bit more than you normally would. If you drive to work, consider parking a few blocks away instead of right near your building. If that’s not realistic for you, try incorporating exercise in other ways. For instance, if you can walk up to your floor instead of riding the elevator, you’re building easy cardio into your routine a few times a day. Stuck on the 20th floor of a high rise? Consider taking the elevator to the 15th floor and walking the last five flights or walking up the escalator instead of standing still. On ground level? Use a kitchen or bathroom that isn’t close to your desk. “I used to work in an office with several floors,” Holmberg says. “For two years, every time I had to use the bathroom, I walked up two flights of stairs to the other end of the hallway!” It seems silly, but you can create a habit of anything if you do it enough times. If you have a lunch break, consider spending it walking. Eat at your desk while you work, and then spend your actual break elevating your heart rate (in a good way, of course!). Keep your tennis shoes in your desk drawer, throw on your headphones and go for a 20- to 30-minute walk. Walking increases your endorphin and serotonin levels, plus research has proven that a brisk, daily walk is associated with better cholesterol ratios and lower blood pressure. If the point of your lunch is to escape work, listen to NPR, the latest episode of your favorite podcast or a book on tape instead. If you have a more flexible workday or a longer lunch break, you may even be able to sneak in a full workout. Take advantage of that in-office gym and shower, or consider joining a yoga studio in close proximity to your office. Staring at a screen for too long each day can cause worsening eyesight and computer vision syndrome (CVS)— eye and vision problems directly related to long-term computer use. For those of you glued to a computer all day, try adjusting your monitor settings to avoid straining your pupils more than necessary. According to Gary Heiting, optometrist and senior editor at All About Vision, the brightness of your screen should match the lighting in your office. To test your settings, look at a blank text document. If it’s glowing, like a source of light, your monitor is too bright. If the white is dull and gray, it’s too dark. Try adjusting your color temperature as well—reducing this setting lowers the blue light emission, which is a short wavelength light that increases eyestrain. Even if you don’t wear glasses or contacts, the American Optometric Association (AOA) suggests considering asking your optometrist for lenses specifically for computer use, which adjust for glare and reflection. Those who already have eyesight problems are more susceptible to CVS and can request glasses or contact lenses that are tinted or coated for maximum comfort. Looking far away relaxes the focusing muscle inside the eye. To relax your eyes, simply gaze at a distant object for at least 20 seconds. Look at a faraway object for 10 to 15 seconds, then focus on something close to you for another 10 to 15 seconds. Repeating this several times reduces the risk of your eyes focusing to lock up. We’ve all heard that you’re supposed to drink eight eight-ounce glasses of water every day. Doctors tend to disagree on whether the eight-by-eight rule is accurate, since you need varying amounts of water based on factors such as your diet, exercise and even the climate you live in. Regardless, it’s easy to forget to drink when you’re sitting immobile for the majority of your day. Make sure you’re staying hydrated by keeping a water bottle at your desk. Plus, drinking more water means walks to the kitchen and extra bathroom breaks—an excellent excuse to get out of your chair! If drinking lots of water is tough for you, try adding fruit or herbs for flavor (raspberries and mint are great!) or purchasing an insulated water bottle that will keep your drink cold all day so it's that much more appealing. Sitting for too long puts pressure on your spine, and hunching over a keyboard can strain your neck, back and shoulders. If you feel comfortable, consider asking your HR department for an ergonomic workspace—the options range from desk treadmills to standing desks. Or, try propping your computer monitor up and spend periods of the day standing at your desk. Holmberg crafted her own standing desk out of a lap desk with collapsible legs that sits on top of her regular desk. You could also think about swapping out your chair for a giant exercise ball. While sitting on a ball, your body is consistently making tiny adjustments to stay properly perched, working your core muscles, improving your posture and helping with overall balance. If you’re willing to shell out a little cash, consider an Isokinetics Ball Chair. Worried your coworkers will make fun of you? Consider this balance pad, which mimics the top of an exercise ball, and no one in your office will even notice! Though it’s tempting to eat out every day, buying lunch often means you’re consuming food that isn’t as healthy—you don’t really know exactly what you’re putting in your body. Getting in your exercise while being productive is the best of both worlds. Holmberg is a huge fan of moving meetings—she often walks with her clients for their hour-long session each week. If you think your coworkers might be interested, suggest taking a walk around your office or a stroll down the street to a coffee shop while talking business. It’s a win-win for everyone! If you have your own office, taking mini breaks and squeezing in five-minute workouts is very feasible—all you have to do is close your office door. Holmberg suggests getting an exercise stepper that you can store under your desk or handheld 3- to 5-pound weights. Mini steps are perfect for 60 to 90 seconds of high-intensity exercise, which are ideal for a quick break. No matter where you work, remember how important it is to consciously stay healthy when you’re cooped up in an office all day! Server responsed at: 04/22/2019 6:20 p.m.